By now every critic and publication has raved about the genius of Yoshimi Battles The Pink Robots, the latest creation from one of the world's most inventive bands, The Flaming Lips. Let me take a turn at it. Yoshimi Battles The Pink Robots is the real deal, an album like The Beatles' Let It Be, or even The Replacements' Let It Be, that fans, critics, and musicians will be talking about for decades to come. It is the rare gem that will see steady sales year after year, as the Lips' catalog grows, so will the sales. What is so special about it? Why is it an album that will continually sell steadily and wow audiences, and go down in history as one of the greatest albums ever created? It's a combination of many factors. It's the future of pop, a testament to the power of melody, the brilliance of writing abstract lyrics and getting people to sing along, as the songs are soaked up in their brain, all the while allowing the listener to derive their own meanings for the compositions. Beyond that, however, it is the band's history. Starting out as a garage band with nothing more than post-punk intentions, they worked long and hard to establish themselves at the forefront of independent rock, their 1986 debut on Restless Records, Hear It Is, garnering them an underground following. Six years later the 1992 release Hit To Death In The Future Head, their debut for Warner Bros. Records, the major label they still call home, redefined what The Lips were about and what one could expect from the band. An overload of guitars, layering, and pop sensibilities, the album baffles even the longtime listener. But its over abundance of sound and sculpturing is where its immortality exists. The trend continued, the band always managing to push the envelope and succeed in raising the bar on themselves. Then came 1999's The Soft Bulletin, no small feat for a band, even of The Lips genius. They were now in a weird, but desirable position. The world was anticipating their next move. They needed to follow-up The Soft Bulletin with something. They could have gone two directions: believe their own hype and create something that sounded bloated and over confident, or they could forget The Soft Bulletin and work on their next project, concentrating on doing the best they could and living with the outcome. And this is why Yoshimi Battles The Pink Robots is one of the best albums ever recorded. The band pulled off the impossible, taking path two and creating something that not only compliments The Soft Bulletin but kicks it up a notch and leaves you in awe. After all, we all know what the Lips are capable of after listening to The Soft Bulletin. But, I for one would have never envisioned that they would create something as stunning as Yoshimi Battles The Pink Robots, even after listening to The Soft Bulletin non-stop for the longest time. A bona-fide classic if there ever was one, Yoshimi Battles The Pink Robots is a concept album about love and the cycle of life. It is the tale of a journey through life, our immortality, the short time we have here, and the love we gain and lose along the way. And everything that tries to alter our reality while we struggle to understand if the life we lead is reality or, as it sometime seems, a beautifully cruel imagination that pits us again ourselves. Wayne Coyne and the Flaming Lips try to walk away from a fight in the opening track, "Fight Test," a harmonious, melodically shining pop gem about loving someone, ultimately realizing that fighting will do no good and that avoiding conflict may be the road to take. Then on "One More Robot / Sympathy 3000-21" a robot tries to be something more than a machine, as things change and its perception on life is expanded. "Yoshimi Battles the Pink Robots pt. 1" has Yoshimi battling the robots, stopping the "evil-natured robots" that are "programmed to destroy" from ending the world. Nobody believes in Yoshimi but The Flaming Lips. A tale of life and defeat and the ability to overcome the hardest of obstacles even against almost impossible odds. "Yoshimi Battles the Pink Robots pt. 2", which quickly succeeds part one, is a slightly psychedelic, experimental noise-pop explosion of sounds and screams. The band stretches with a musical intermission that lightens up the story and builds suspense at the same time, allowing the band to create layers of melodic noise and show you that even without words they can tell a story worthy of your attention. The entire album continues down this path, as the story, along with life, takes many adventures, but always comes back to love and relationships between people and their surroundings. Gentle pop, captivating melodies, orchestration and layers of instrumentation, Wayne Coyne and his mastermind outfit The Flaming Lips redefine the word quirky, as well as pop music, insuring themselves a place in the rock 'n' roll hall of fame. Yoshimi Battles The Pink Robots is an album that even those who don't get it (parish the thought) will agree that it is driven by mad genius and experimentation that pays off. It is a colossal album of imagination, experience, and optimism, a beautiful album that, like a child, is born into the world and grows when nurtured and loved, becoming something different each and every time it is listened to. I'll give it an A+. 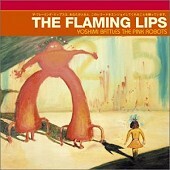 The Flaming Lips' Audio Player for Yoshimi Battles the Pink Robots: http://www.flaminglips.com/player/index.html.